Available now from laboratory equipment specialists John Morris Scientific , Stanhope-Seta's new rapid fuel screening instrument for FAME In Jet fuel, the FIJI (FAME In Jet Instrument), uses test method IP 583 to determine the parts per million level of fatty acid methyl ester (FAME) in aviation turbine fuel. The FIJI fuel screening instrument is ideal for both laboratory and field applications and does not require any specialised operator training. It is quick and simple to use, has a measuring range of 20 -150 mg/kg and is capable of detecting all types of FAME in the range of C8 to C22. 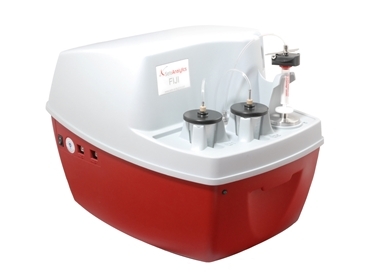 The sample preparation module pumps the sample (max 50ml) at a controlled rate through a disposable cartridge, the components are then spectrally analysed via Fourier Transform Infrared Spectrometry (FTIS). The total analysis time is 20 minutes (assuming the unit has already reached the operating temperature) and test results can be viewed on a graphical spectrum via windows XP/Vista/7 software. Stanhope Seta have combined their innovative sample preparation system with Fourier Transform Infra-red (FTIR) spectroscopy technology to provide a detection accuracy as low as 20mg/kg. The FIJI fuel screening instrument is self cleaning and does not require any solvents. The cartridge can be quickly and simply replaced after each test.